Confession: After moving to Los Angeles nearly fourteen years ago to become a screenwriter, I have yet to write a script (bar for a few short films). This even after I bought a fancy laptop so I could stop making excuses about feeling too restrained at a desk (wireless internet + blogs is my crack). Anyway, I know I’m not alone out there. Los Angeles isn’t just a city of a million stories… it’s a city of a million unwritten stories. Alas, upon Cybele’s suggestion, I signed up for Script Frenzy, a month long challenge/support group to get a draft done in 30 days. Besides support and the allure of bragging rights, Script Frenzy doesn’t offer anything – but maybe thats enough (not to mention its free to sign up). 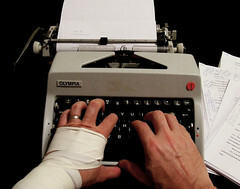 The way it works is beginning June 1st, you start hammering away on your screenplay. Every so often (day, week, whatever) you upload what you’ve written to Script Frenzy, which keeps track of how many words you’ve written. If you write 20,000 words – what they estimate to be the length of an average feature screenplay – you can call yourself a Script Frenzy “winner”. To keep you going, fellow writers meet on their very active message boards sharing writing tips, boosting each other’s egos, and trying to keep themeselves and everyone else from falling by the wayside. If you’re looking for some in person support, members all over coordinate “write-ins” at neighborhood coffee shops. There’s several planned locally: in Studio City at Lulu’s Beehive, in Long Beach at the Royal Cup Coffee House, and the Cows End and Novel Cafe in the Venice area*. Basically, you meet up, chit chat a little if you want, and just write as the click-clackity sounds of fellow former procrastinating screenwriters surround you. At the very least folks, give it a try. I know most of you have at one point or another bought a ream of three-hole punch paper and a box of brads, determined you’d finally write your script. Why not join in with the frenzy? *Unfortunately, none are listed in Hollywood, but if anyone is interested give me a shout – my screenname over at Script Frenzy is Unsomnambulist, or email me: unsomnambulist at gmail dot com. i too moved to los angeles with the hopes of becoming a screenwriter, only to end up getting heavily into cinematography. i’m taking a break from production to work in post now, and a great kpcc interview with michael chabon inspired me to get back into writing. btw, what’s chabon’s big writing secret? I’m in, and I’m terrified. Hey look, I’m living the dream! Knowing that NaNoWriMo’s word count is a little womlu (50,000 words is short for young adult and unheard of for commercial fiction), I curiously checked the word count of the two screenplays my partner and I’ve completed. They come in at 24,000 words (sci-fi/action) and 19,000 words (horror), making the goal of Script Frenzy downright realistic. Cool! We’re working on #3, so I won’t be participating in Script Frenzy (because, um, that would be insane). But I wholeheartedly support anyone who is and offer any assistance I can give. Also: I bought a fancy laptop for the same reason. I blog on it. We wrote the scripts on his non-fancy desktop. Oh well. I was looking up how to contact the Parking Violations Bureau and ended up here. I’ve been meaning to write a new script for ages; it must be that Law of Attraction thing. I’m specializing in movies that put the audience to sleep, so it shouldn’t be too hard. Joined, primed, ready to completely slack off.